On an uncertain date in 1661, the Danish noble Kaj Lykke (sometimes Kai Lykke) — safely but penuriously absconded to exile — was “executed” in effigy. This wealthy roue (Danish Wikipedia page) was famous for his affairs innumerable. To one of these maids, Lykke addressed a love-note remarking that the unpopular queen consort Sophie Amalie enjoyed queen consorting with her servants. The sort of salacious rumor-mongering that constitutes many a blogger’s daily bread (and no doubt many a debauched noble’s pillow-talk) was, in Denmark at the dawn of its absolute monarchy, lese-majesty, and a good excuse once it became known to seize the naughty noble’s riches for the crown. Lykke got himself abroad and didn’t have to face the music in the flesh — though the forfeited estates were no mean loss — and a doll representing the dirty-minded fugitive had its hands and head lopped off in Lykke’s stead in Copenhagen. 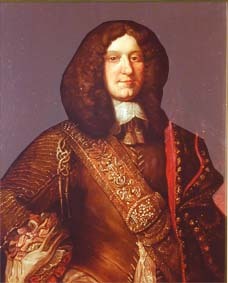 Kaj Lykke returned from exile (Swedish link) and died in Denmark in 1699. Centuries later, his skull was unearthed pursuant to eugenics research: the theory was that this bad boy’s sloping forehead showed him to be a primitive Neanderthal-descended type.